In this episode we chat with Nova Scotia resident and edible gardening expert Niki Jabbour about season extension. Niki believes that a long Canadian winter shouldn’t mean an end to the homegrown harvest and is here to share simple tricks and pro-tips that we can also use to extend our harvests into the winter and early spring, no matter what part of the courtry you may be growing in. Plan ahead: As we’ve mentioned in previous episodes, it’s crucial that you get your crops established BEFORE the cool, short days of winter kick in. 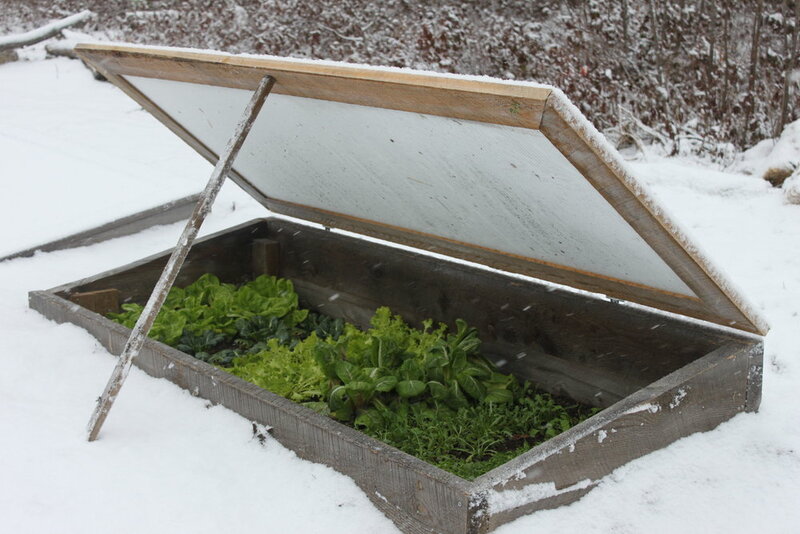 Cold frames: Cold frames are especially useful in snowy climates because they’ll hold up under the weight of the snow. Greenhouse poly cold-frames: One of Niki’s pro-tips is to use greenhouse poly instead of glass when making a cold frame. She suggests that you can still re-use old windows if you don’t want to build new frames, but that knocking out the glass and replacing it with greenhouse poly will save you from a big mess later down the road. Polycarbonate panels: These also make great cold-frame covers, and is the material that we use when building new, custom cold-frames for Seattle Urban Farm Co. clients. Row cover: Row cover is an inexpensive garden tool with multiple applications, from pest exclusion to season extension. In milder climates, row covers are an excellent season extension tool because the floating fabric will protect your crops from light frost, which will extend the life of your semi-cold hardy crops and enable you to extend the harvest period of your cold-hardy crops. In many cases, the row cover fabric is draped over a series of short hoops to make what’s referred to as a “low tunnel”. Row covers some in a variety of weights, and for season extension, you’ll want one that still lets light in but is heavy enough to protect the plants from the cold. 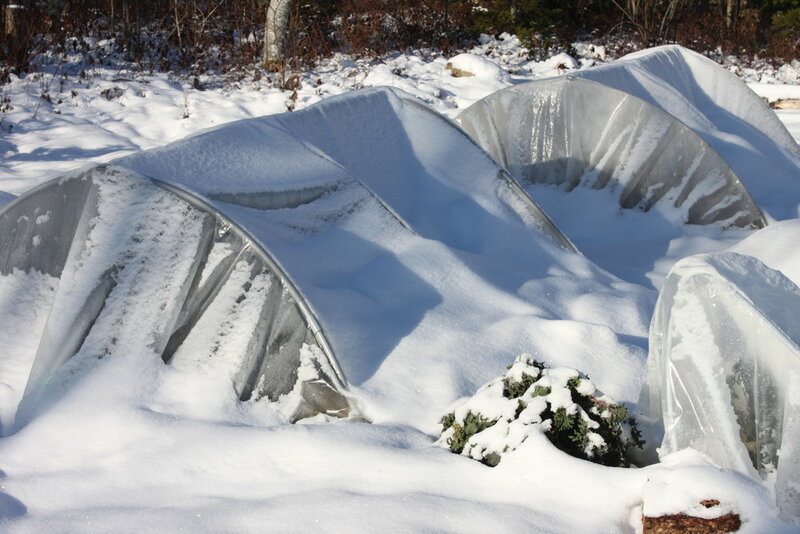 Greenhouse poly can also be used over low tunnels to protect winter crops. Don’t harvest frozen crops: With the exception of kale, harvesting frozen crops will result in a big pile of mush once they’ve warmed up. Wait until the warmest hours of the day to harvest your winter crops. The following photos were taken by Nik Jabbour and show some of the infrastructure we discuss holding up to a Nova Scotia winter! Niki is an award-winning author and edibles expert from Halifax, Nova Scotia, who believes that a long Canadian winter shouldn’t mean an end to the homegrown harvest. Niki grows dozens of different vegetable varieties in her 2,000-square-foot garden, including experimental crops like quinoa, peanuts, artichokes and figs. Niki’s unconventional – yet wildly successful – growing techniques are proof that elbow-deep snow is not, in fact, a valid excuse for a puny parsnip harvest. Her first book, The Year Round Vegetable Gardener, was honored with the 2012 American Horticultural Society’s Book Award, and her latest title, Groundbreaking Food Gardens: 73 Plans That Will Change the Way You Grow Your Garden (Storey Publishing, 2014) opens your eyes to an infinite number of tasty possibilities. Look for her next book, Niki Jabbour’s Veggie Garden Remix in January 2018. Niki's gardening blog, SavvyGardening, just won Best Overall Garden Blog and Best Digital Media from the GWA, the Association for Garden Communicators!